How Would Nixon Handle Russia in the 21st Century? Although the Cold War is almost three decades behind us, relations between the United States and Russia are icy. Initial optimism for a friendly relationship began to ebb in the 2000s following a series of international incidents in Yugoslavia, Ukraine, and Crimea. Today, it would appear the intense disagreements over the situation in Syria threaten any progress made between the two nations. In a series of heated and highly publicized deliberations, US Secretary of State John Kerry and Russian Foreign Minister Sergey Lavrov failed to advance the conclusion of the conflict, let alone an effective ceasefire that would allow for vital humanitarian aid. For those of us at the Nixon Foundation, that leaves one essential question: if confronted with modern US-Russian relations troubled by a civil war in the Middle East, what would President Nixon do? Détente was the word of the decade when it came to US Cold War policy in the 1970s. Typically defined as the easing of tensions between the United States and Soviet Union, détente depended on proactive negotiations between the superpowers on a plethora of issues. Essentially, it was a method of dealing with Soviet encroachment, without the threat of a disastrous nuclear war. 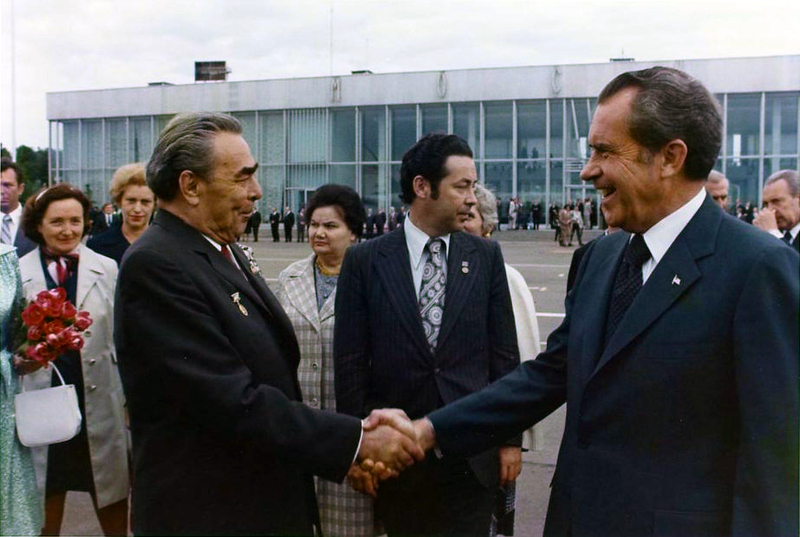 President Nixon approached the Soviet problem with thoughtful, yet assertive, diplomacy. Both the Indo-Pakistani War of 1971 and the Vietnam War, two highly distinctive regional conflicts, illustrate the dexterity behind Nixon’s policy of détente. In Southern Asia, India found an ally in the Soviet Union, while the People’s Republic of China provided aid to Pakistan. When India invaded her neighbor on December 3, 1971, after a tense year of fighting between East and West Pakistan, the potential confrontation between the Soviet Union and communist China reached a peak. President Nixon decided to “discourage both Indian aggression and Soviet adventurism” by informing the Soviets that “we would strongly oppose the dismemberment of Pakistan by a Soviet ally using Soviet arms.” A flurry of correspondence between President Nixon and Soviet Secretary-General Brezhnev encouraged a more active role in the latter’s arbitration for peace, including a tactical redeployment of a naval task force (link) by President Nixon, resulted in India issuing a ceasefire to Pakistan. President Nixon inherited the Vietnam War from his predecessors, and was challenged with ending the war from his first day in office. Despite the fierce ideological differences of the northern and southern armies, the Soviet Union was Nixon’s primary obstacle to peace. Negotiations with Hanoi proved problematic so long as the Soviet Union provided support to the communist regime. Vietnam aggravated US-Soviet relations to a greater extent than any other shared concerns, but in order to conclude American involvement in Southeast Asia, President Nixon had to work with the Soviet Union on a variety of issues. Following the Easter Offensive in 1972, a northern invasion launched mere months before the first Moscow summit was set to take place, and a round of unsuccessful peace talks in Paris, Nixon struggled with justifying how he “could go to the summit and be clinking glasses with Brezhnev while Soviet tanks were rumbling through Hue or Quangtri…For us to cancel the summit, however, would inevitably be criticized as an impulsive action that dashed the hopes for progress toward a more peaceful world.” In fact, President Nixon authorized a coordinated bombing campaign against military targets in Hanoi and the mining of Haiphong harbor as a means to counter the North Vietnamese offensive. Pundits and several administration officials alike were convinced that this bold decision would compromise the scheduled summit between the U.S. and Soviet Union. However, to the surprise of many, Moscow displayed no intentions of canceling the summit. When Dobrynin said that his government wanted to begin talks in the area of arms limitation, I expressed my feeling that progress in one area must logically be linked to progress in other areas. ‘History makes it clear that wars result not so much from arms, or even from arms races, as they do from underlying political differences and political problems,’ I said. “So I think it is incumbent on us, when we begin strategic arms talks, to do what we can in a parallel way to defuse critical political situations in the Middle East and Vietnam and Berlin, where there is danger that arms might be put to use. President Nixon understood that pursuit of peace required an ability to work with the enemy. In order to negotiate peace in Vietnam or press for a ceasefire between India and Pakistan, Nixon believed that other improvements in the US-Soviet relationship would lead to cooperation, and hopefully the avoidance of future conflict. President Nixon would undertake the problems straining the current US-Russian relationship by first accepting that a prosperous partnership in Syria, might only be possible after the successful mediation of other matters. The importance of such linkage was recognized by President Nixon in the 1970s, and might be what American and Russian foreign policymakers are missing today.